In the 2018 academic year, Vatel Nantes is hosting its 40 first students who will be starting their 1st Bachelor in International Hotel Management year on a brand-new campus! Among them we have Edouard Butin and Milos Buchet, two young men that are quite different while sharing the same goal: building a future for themselves in the tourism and international hospitality industries. To do this, they both decided to go to Vatel, with its internationally driven courses and its educational philosophy based on a tried and tested mixture of theory and professional experience. But what do their parents think of this choice? 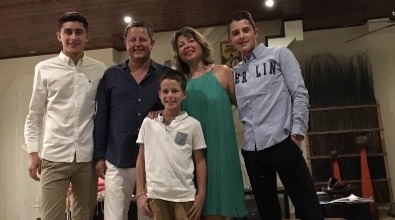 Dominique and David Butin, both associate managers in a group of schools specialized in educational methods, have three sons. “Edouard’s idea to continue his education in hospitality was something we discussed as a family. While quite a few sectors actually restrict the field of possibilities, there are 1,001 different kinds of work in the hospitality industry, allowing you to bounce back in many types of activities. The complementarity of theoretical courses in the classroom, associated with professional experience with real customers was what we appreciated, and we were also convinced by Vatel’s great reputation."